The works of postwar art circles that inherited the prewar system were not only incompatible with currents of international art but also remote from reality of the physically devastated country and the mentally exhausted nation. Rather, painters having been bearing avant-garde movements from the prewar period, such as TSURUOKA Masao (鶴岡政男) or ABE Nobuya (阿部展也), well expressed the stifling situations in portraits of traumatized people. TSURUOKA Masao (鶴岡政男) became the talk of people by executing "Heavy Hand" in 1949, the same year FUJITA Tsuguharu (藤田嗣治) left Japan. Realism, namely attempts to capture reality by depicting it as it appears, had provoked a series of "Realism Controversy" in art magazines "Mizue," "Atlier" and others since 1946. The communist critic HAYASHI Fumio (林文雄) and the painter NAGAI Kiyoshi (永井潔) of NIHON BIJUTSU KAI embraced "Democratic Realism" that dogmatically denied all the avant-garde movements ever since Impressionism*1c1, resulting in similar attitute to that of Socialist Realism in the USSR of the 1930s*1c2. On the contrary, the critic UEMURA Takachiyo (植村鷹千代) argued that avant-garde having developed into abstract art or surrealism could better capture reality of the uncertain subject. And, the critic HIJIKATA Teiichi (土方定一) posed a question whether one could find another way to pursue realism different from either Democratic Realism or the revival of prewar avant-garde, setting off an issue later to be known as "another kind of realism"*1c3. OKAMOTO Taro (岡本太郎), the painter who was in the midst of the heyday of prewar avant-garde movements in the 1930s' Paris, proclaimed "Bipolar Oppositionalism" in 1947 and energetically engaged in activities like assembling artists, critics and writers to organize "YORU NO KAI" (Night Meeting) or carrying out reformation of NIKA Association inside. Regarding the avant-garde as confrontation of abstract art and surrealism, he dared to present letting them stay bipolar instead of sublating them dialectically, applying the idea to any opposition such as themes and techniques, the East and the West, ideology and its surroundings, the conflict between reality and the ideal, and so on. He also declared "Should not be skillful. Should not be elegant. Should not be comfortable" as the three principles of contemporary art, rejecting initially the conventional system of Japanese art circles but also skill-oriented realism painters or easy-minded Western art followers, while calling for creation of absolute values solely following one's own subjectivity. See *2b1 as for the word "avant-garde." 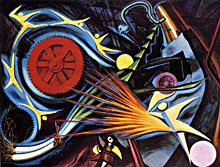 Interpreted from a historical perspective, avant-garde art, having pushed forward from impressionism to abstract art, had gradually lost themes to draw and mass to appeal, which eventually brought about coservativist reactions, on one hand in socialist and democratic realism and on the other hand in fascist art. For instance, Nazis' nationalistic art and Japanese military's war paintings were both fascist art in either neoclassical or romanticist fashion, and realism was just a technique adopted to depict objects that correspond to certain themes. 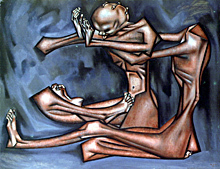 In this sense, postwar Japan's democratic realism and the USSR's socialist realism were structurally identical to Nazism art and wartime Japan's war paintings in that all these were made to propagate their themes to the mass, so that they differed only in content of the themes like democracy, socialism, or nationalism. 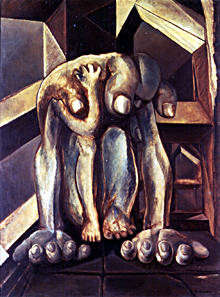 Similarly, the analogous structure of propagating themes to the mass can be pointed out to surrealistic figures in paintings like "Heavy Hand," which adopted surrealistic techniques to represent the reality rather than radical surrealism to deny the reality. Therefore, it is fair to conclude that the style of art during and just after the war is continuous and can be summed up as the era in which the figurative painting was forceful. See *8d5. Fruits of this "another kind of realism" may be found in "Reportage Painting" and "Closed-Door Painting" to be discussed in the next section 1d. - One of the purposes of this book is to examine whether Japan as the local subject can attain genuine independence. Interestingly, in anticipation of Nazi invasion, OKAMOTO Taro (岡本太郎) left Paris for his mother country with saying "Here is not where I shall fight," despite his once intending to reside there permanently. Yet, no matter how absolutely he had confirmed his own independence, the mainstream discourses of Japanese art history ever since seem to have reluctantly treated him as an exception or an outsider. Besides, it is also possible to regard his Bipolar Oppositionalism evident in works like "Heavy Industry" as if reinterpreting and localizing depaysement (displacement) of surrealism. - Activities of OKAMOTO Taro (岡本太郎) after this period were as follows. In the 1950s, he discovered "primitive beauty" in ancient Japanese potteries of the prehistoric Jomon era (c.100,000 B.C. - 500 B.C. ), which prompted his endeavor to link contemporary society with indigenous folk culture instead of aristocratic sophistication. In the 1970s, he constructed "The Tower of the Sun" as the symbol of the EXPO'70 (Japan World Exposition, Osaka in 1970). And, in the 1980s, he came to frequently appear on TV shows with propagating a catch "Art is explosion!" It is probable that the word "explosion" referred implicitly to the atomic bombs.